In the late 1800s, John Wesley Powell, second Director of the U.S. Geological Survey (USGS), proposed gaging the flow of rivers and streams in the Western United States to evaluate the potential for irrigation. Around the same time, several cities in the Eastern United States established primitive streamgages for use in designing water-supply systems. Streamgaging technology has greatly advanced since the 1800s, and USGS hydrographers have made at least one streamflow measurement at more than 37,000 sites throughout the years. Today, the USGS Groundwater and Streamflow Information Program supports the collection and (or) delivery of both streamflow and water-level information for more than 8,500 sites (continuous or partial record) and water-level information alone for more than 1,700 additional sites. The data are served online—most in near realtime—to meet many diverse needs; more than 640 million requests for streamflow information were fulfilled during the 2017 water year (Oct. 1, 2016‒Sept. 30, 2017). The streamgages are primarily operated and maintained by the USGS, but most are funded in partnership with one or more of about 1,400 Federal, State, local, and Tribal agencies or organizations. This unique cooperation results in nationally consistent and impartial data that also aids local decision making. The shared costs result in the operation of far more streamgages than would be possible if financed solely by USGS appropriations, which provide less than one-third of the needed funding. These partnerships also enable fixed costs (such as costs associated with data storage and delivery infrastructure) to be broadly distributed, resulting in more economical streamgaging information for all. The USGS streamgaging network is a multipurpose network that comprises more than 10,000 streamgages. It encompasses several smaller networks that produce specific information or support specific needs. National Streamflow Network (NSN). The National Streamflow Network (NSN) consists of all streamgages that continuously monitor streamflow year-round and from which daily mean streamflows are computed and made available online. The data collected at NSN streamgages serve several functions (including flood warning, water allocation, and recreation) and can be used by anyone regardless of whether or not they help fund the network. The use of consistent methods enables data from the many gages to be combined, expanding the use and value of the data from every gage. At present (2018), more than 8,200 gages are in the NSN. Federal Priority Streamgages (FPS). 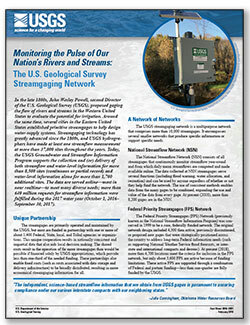 The Federal Priority Streamgages (FPS) Network (previously known as the National Streamflow Information Program) was conceived in 1999 to be a core, federally funded network. The original network design included 4,300 then active, previously discontinued, or proposed new gages that were strategically positioned across the country to address long-term Federal information needs (such as supporting National Weather Service flood forecasts, or interstate and international compacts and decrees). At present (2018), more than 4,700 locations meet the criteria for inclusion in the FPS network, but only about 3,600 FPS are active because of funding limitations. These active FPS are supported through a combination of Federal and partner funding—less than one-quarter are fully funded by the USGS. designing reservoirs, roads, bridges, drinking water and wastewater facilities. Below are other pages associated with the USGS streamgaging network. The USGS operates one of the largest streamgaging enterprises in the world. At most gages, continuously measured water levels are used to compute hourly (or more frequent) streamflow from gage-specific rating curves developed using onsite streamflow measurements made by USGS hydrographers. The data are quality assured and made available online. Below are publications associated with the USGS streamgaging network. Below are data or web applications associated with the USGS streamgaging network. The USGS WaterNow service lets users receive current conditions for USGS water-data-collection stations on demand via email or cell-phone text message. The user sends an email or text message containing a USGS current-conditions gaging site number, and will quickly receive a reply with the station's most recent data for one or more of its monitored parameters. The U.S. Geological Survey WaterAlert service sends e-mail or text (SMS) messages when certain parameters, as measured by a USGS real-time data-collection station, exceed user-definable thresholds. The development and maintenance of the WaterAlert system is supported by the USGS and its partners, including numerous federal, state, and local agencies. The USGS provides real-time or near-real-time conditions water data at sites across the Nation. Current data typically are recorded at 15- to 60-minute intervals, stored onsite, and then transmitted to USGS offices every 1 to 4 hours, depending on the data relay technique used. Recording and transmission times may be more frequent during critical events. This site serves USGS water data (streamflow, groundwater, water quality, site information, and statistics) via automated means using web services and extensible markup language (XML), as well as other popular media types. Services are invoked with the REST protocol. These services designed for high fault tolerance and very high availability. Below are map products associated with the USGS streamgaging network. Below are multimedia items associated with the USGS streamgaging network.